Every business has to watch their bottom line. While records management is an important function of your company, it will often take a back burner to other, more immediate concerns. Often, a records management program is only thought of when space becomes an issue or there has been a security break of some sort. Most view records management with a commercial facility as an "added" expense, failing to realize that they are currently paying for records management in some fashion already. What does this all mean? 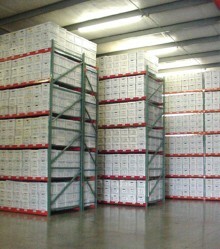 In essence, regardless of how you are storing your records currently, there is a cost associated with that. That cost could be in space being used that you could put to other uses, in the rental of self-storage units, or in the cost of man hours necessary to maintain your records and find records as needed. In almost every instance, the cost of using a commercial center, such as Records Management Services, will inevitably be less than the cost of managing your records internally when real values are given to the costs associated with space and labor.